To make the world healthier and fitter, we introduce the StandUpBox. 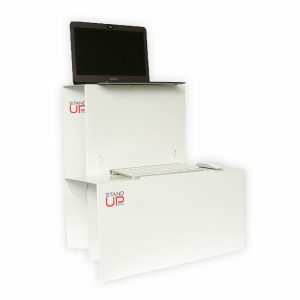 The StandUpBox is a patented super convenient foldable desk-raiser made of 100% recycled cardboard. The box is so strong it can hold your laptop and keyboard but, at the same time is so flexible that it can be folded into a three-centimeter thick package. As a result, you can always take your StandUpBox with you and/or store it easily. The StandUpBox makes it easy to switch between working while sitting and working standing up. The StandUpBox is good for both your health and your wallet. It costs only € 49,95, drastically less than the hundreds of euros youd to buy a new standing desk. 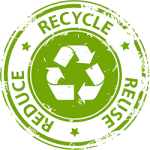 We are proud that we’ve managed to design a desk-raiser made of 100% recycled cardboard with a wear-resistand biobased degradable layer. The StandUpBox is, in part, manufactured by people with a disability in a sheltered working environment. This way our company creates work- and learning opportunities for people who have fewer chances in the working field. 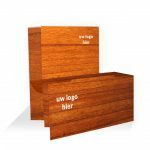 We, Koen & Anette, have prioritized our social and sustainable values during the whole design- and production process. That’s why we call the StandUpBox the desk-raiser with a good story. Not in soccer like in1988, but in sitting! According to research, 32 percent of the Dutch people sit more than 7.5 hours a day, which makes us European Champion in sitting. Sitting that many hours a day has a couple of medical consequences. It increases the chances of getting diabetes and heart and vascular diseases. This eventually could lead to a higher chance of dying earlier. Professor Maria Hopman of the Radboud University in Nijmegen stimates 8.000 people per year die from illnesses related to sitting too much. According to Harvard Business Review investing in the health and welfare of employees will result in less absence due to illness and an increase in the productivity of employees. 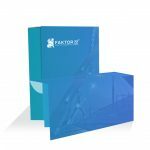 Not only we do believe in our product,so do our customisers and medical professionals. Jules Reintjes, physical and manual therapist, recommends people with a sedentary job to work with a StandUpBox more often because it has a positive effect on your vitality. 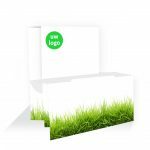 The StandUpBox comes traditionally in white but is customizable in every colour/pattern/photo you want, including company logo’s. 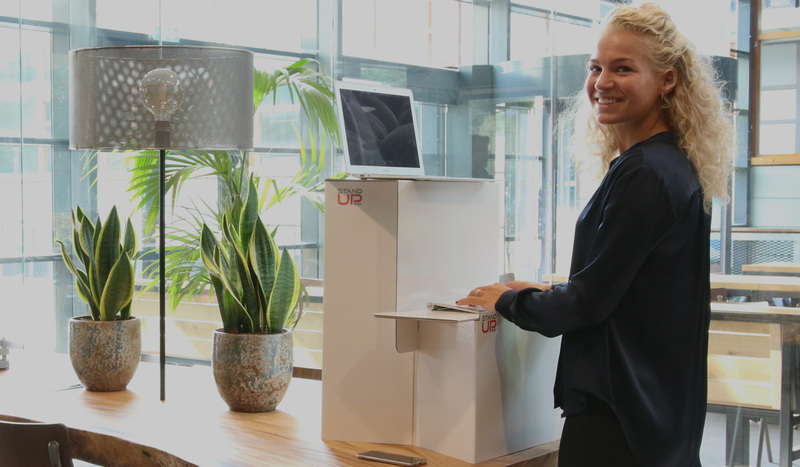 Stand up for your health with the StandUpBox, the sustainable, portable and affordable desk raiser. 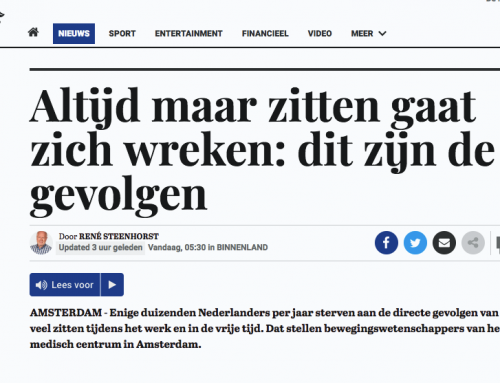 Heb je klachten door zittend beeldschermwerk? Een opvouwbare bureauverhoger van hoogwaardig karton. 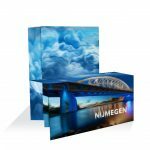 Lichtgewicht, gemakkelijk op te zetten en volledig te customizen. De StandUpBox is het alternatief voor de dure en inflexibele sta-werkplek oplossingen zoals een elektrisch hoog-laagbureau. Het slimme design maakt staand werken met diverse devices mogelijk. Zonder hoge uitgaven, zonder gedoe.